Eat a doughnut I guess. Okay so fine. He didn't call me fat. But he goes, "I can help you get there." In reference to weight loss. The thing is, I didn't even offer or suggest that I wanted to. Eh. I guess the steps to take would be to: 1) not care OR 2) care enough to do something about it 3) just whine and gripe. There will be a combination of all 3 involved. I think I am going deaf in my right ear. It's been ringing all day and right now it feels numb. I read the most beautiful book the other day. When I read books like this, I'm always afraid I won't find anything that meets the greatness of it. It's a historical fiction about the Holocaust. But it's much more than that. Head over to Goodreads and you'll get a lot more better information than I can give you here (this is also my hint that we should be "friends" via this amazing site). But just know that I cried in the middle of this book. That's saying something. 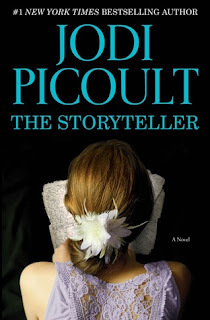 I've only ever cried at the end of a few other books, one of which is another Jodi Picoult. And another of them was Harry Potter. So it's a kind of a big deal. I read it in two days. Which meant my kids went hungry. Just kidding. You forget that I'm a speed reader. So what I should say is, I read it in two nights. This day started off super crappy. And it still is crappy. But it's better because I have good people in my life who make it thus when I can't do it for myself. Do you have Voxer yet? Get on it if not. Also, if your brother in law calls you fat, you should probably watch Anna Kendrick's new video for "Cups" (When I'm Gone). It's super cute. And makes you feel good. I love feel good stuff. It's a video I wouldn't be ashamed to have my nieces or nephews watch. In fact, I'm gonna show them. Because I play this game. And I'm the master at it. We do it where you sit in a circle and pass the cup. If you mess up, you're out. Try it. Try it with your mom or dad or your kids. So fun. If you have a hard time remembering the beat it also goes to "knick knack patty whack, give a dog a bone, this old man came running home." Anyway, that's kind of all for now. I hope you enjoyed all the free advertising I gave you.